The United States Flag Store’s Support Our Troops Flags, Pins, and Magnets are the perfect way to support our troops, whether or not you have a family member or friend serving in the Armed Forces. All of the Flag Store’s Support Our Troops flags are 3 feet by 5 feet and made from superknit polyester, giving the flag a silky look without compromising durability, and include two brass grommets for easy hanging. Flags are made exclusively for the Online Stores, Inc. Flag Store and may be hung inside our outside. If you’re looking for a simple way to express your support for the troops, the Flag Store has several flags to meet your needs. The Yellow Ribbon Flag features the yellow remembrance ribbon printed on a white background. These flags sell for just $9.95 and are as low as $7.95 when bought in bulk: a perfect idea for a neighborhood support rally! The Flag Store also features Support Our Troops Flags with the yellow remembrance ribbon on a blue backdrop in three versions. All three flags have the text: “Support Our Troops” and list each branch of the armed forces. One version features the United States bald eagle as well. Each of these flags are only $11.95 and are as low as $8.95 when bought in larger quantities. If you want to show your support for a family member serving in the war in Iraq or Afghanistan, the Flag Store sells traditional Service Flags manufactured in the United States from wool blends. At an unbeatable price of $18.95, flags can have up to five stars and include a wooden dowel, wood gilt spear caps, a chainette tassel, a suction cup, and a pamphlet about the service flag. You can also customize these Service Flags to include the name of your relative serving in the armed forces. Certain rules apply to displaying service flags and they can only be used to honor immediate family members on active or reserve duty. The Flag Store also offers a wide variety of magnets and pins to show your support for the troops on your car, refrigerator, or clothing. At prices as low as 90 cents, order a few for you and your family members or friends today! Baseball season is in full swing and The United States Flag Store and what better way to show your home team allegiance with a Major League Baseball flag, banner, or pennant. All flags, banners, and pennants are officially licensed, made of durable high quality material, and are sold at prices that can’t be beat! Flags, banners, and pennants look great hanging on a wall or window in your house, apartment, or dorm room, outside from your front porch, or in your backyard garden. The United States Flag Store’s 3ft-by-5ft Major League Baseball Flags are a great way to boldly show your support for your favorite baseball team. The flags are made from durable 100% polyester and are vibrantly colored to withstand outdoor weather conditions. Hang these flags on a wall for indoor decoration or outside on a flagpole. You could even take them to the baseball game and drape it over the stands. Flags are made in the United States and are sold at the unbeatable price of $26.95. Featuring 31 Major League Baseball teams, these flags would make a great Father’s Day gift. The Flag Store’s Major League Baseball banner flags are fantastic because they feature sewn, not printed, logos. Banner flags are 28 inches by 44 inches, hang vertically, and are made from durable 100% nylon. The team logo is appliquéd, creating a truly authentic, classy look. The Flag Store features 32 Major League Baseball teams so you’re sure to find your favorite team to support. At a price of $28.99 each, these flags are a great way to show your team spirit. Major League Ball yard and wall pennant flags are the classic way to show your baseball spirit. The Flag Store sells fourteen different Major League Baseball team’s pennants, each measuring 14 inches by 34 inches and made from 420 Denier Nylon, a durable, weather-resistant material. At only $12.95 each, don’t hesitate to display your team spirit on your wall, in a window, or with a garden flagpole in your yard. We’ve Got Temporary Tattoos – Enough Said! If you’re like me, you hate permanence. I mean, who wants to do anything that’s permanent? Take getting married, for instance—strictly for the birds. That’s why I nearly hit the roof when I found out that my employer, the U.S. Flag Store, sells temporary tattoos! Temporary tattoos are by far one of the coolest inventions ever, especially if you’re a child or enjoy acting like one! Some of our most popular temporary tattoos are those featuring the American flag. These temporary tattoos are easy to apply, last for days and can be easily removed whenever you’re ready. They’re also safe for children, so don’t be afraid to pass them around to the little ones. We also offer a set of temporary tattoos that are perfect for the 4th of July, which is just around the corner. These Patriotic Temporary Body Tattoos come in a set of 24, are easily applied with a bit of water and a wet towel, and are just all around cool! Check them out! Temporary tattoos from countries besides the United States are also available. Our Mexican Flag Temporary Tattoos are very popular, and the Canadian Flag Temporary Tattoos are equally awesome! If you or someone you know is in the military, we’ve also got military temporary tattoos! Is daddy in the Marine Corps? Why not give his son a U.S. Marines Temporary Tattoo? Maybe the little guy’s big brother just joined the Navy. Why not hook him up with a U.S. Navy Temporary Tattoo? Did mom just enlist in the Air Force? Well, the best thing you could give her child is a brand new U.S. Air Force Temporary Tattoo! Other temporary tattoos offered by the U.S. Flag Store include those featuring the pirate skull and bones, the Texas flag, and the 1st Navy Jack! Don’t miss out on a great opportunity to score some great temporary tattoos! Order today! If for some reason you’re unable to fly a flag, flag patches are another great way of throwing your support behind a country. The U.S. Flag Store sells more flag patches than anyone else in the world today. We offer over 70 flag patches from such countries as Bolivia, Vietnam, India, Ireland and, of course, the good old United States of America, so no matter where you’re from, we’ve got the flag patch you’re looking for. Putting one of our embroidered flag patches on your backpack, computer bag or coat is a great way of letting everyone know where your allegiance lies. And the flag patch doesn’t necessarily have to be from the United States. Did your family come here from the old country years ago? Why not show everyone that you embrace your European roots by using an Italian or Irish flag patch? Maybe it was Germany that your folks came from, or perhaps Poland? Wherever they came from, you’ll find any and all the flag patches you could ever need at the U.S. Flag Store. As we all know, many of the people living in the U.S. these days are of Mexican decent. Mexico is truly one of the greatest countries on the face of the earth. Its people are kind, generous, and welcoming. 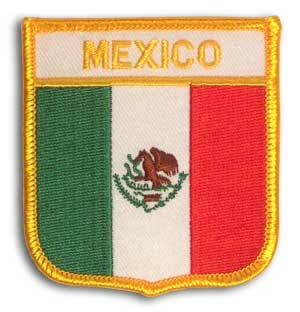 Anyone that is lucky enough to say they’re Mexican should do themselves a favor and get a Mexican flag patch. Many people also come from other great places in Latin America such as El Salvador and Honduras. The U.S. Flag also has great flag patches from those countries. The FIFA World Cup is also just around the corner. Support your team by picking up a few flag patches from the U.S. Flag Store. Flag patches are the perfect way to support your team throughout the entire tournament. I already have a patch on my coat, which is my way of the supporting the U.S. team. You should do the same. Don’t miss out! The flag of Spain was officially accepted as part of the Spanish Constitution in 1978, however its origins date back to the Spanish naval flag of 1783. The flag consists of three horizontal stripes: two thin red stripes on the top and bottom of the flag, and one thick yellow stripe that is twice the width of the red stripes. Slightly to the left on in the yellow stripe is Spain’s coat of arms. Unlike flags of many other countries, Spain’s flag has remained largely the same since its first uses in the late 18th century. The one exception to this is during the Second Republic of Spain (1931-1939), when an indigo stripe, symbolizing a new non-monarchic Republic and also the Castile kingdom, stood in place of the bottom red stripe. The Spanish coat of arms is complex and actually comprised of six other coats of arms. The top left section of the shield, a gold castle in a red background, symbolizes the kingdom of Castile. In the 9th through 12 centuries, Castile was an autonomous medieval kingdom. It unified in 1230 with León. The red lion in the upper right corner symbolizes León. León was founded by the Romans in the first century BC and was a military camp in the early first century. Although the city struggled with Muslim invaders, it remained a Catholic city and officially became a Kingdom in 910. The red and yellow stripes in the lower left corner symbolize the kingdom of Aragon, a medieval kingdom in the northeast region of Spain, near the French border. The gold chains in the lower right corner symbolize the kingdom of Navarre, also in the northern region of Spain. During the Roman Empire, the Vascones occupied this region, maintaining their language and traditions despite the Roman rule. In 1513, Castile conquered the southern part of Navarre. Although the northern part of the kingdom remained independent for several decades, it voluntarily joined with France in 1589 and actually became part of the French Kingdom in 1620. The pomegranate flower comes from the kingdom of Granada. Granada lies at the base of the Sierra Nevada mountains and at the merging point of the Beiro, Darro, and Genil Rivers. Due to its strategic location, Granada is the oldest of the cities represented on the Spanish flag, and was part of the ancient Ibeo-Celtic, Phoenician, and Carthagenian settlements, and later part of the Greek and Roman empires. Finally, the fleur-de-lis, in the center of the shield, represents the House of Bourbon. Bourbon rulers controlled Navarre beginning in 1555. The House of Bourbon, however, dates back to the early 13th century and Bourbon kings, including Henry IV, Louis XIII-XVIII, and Charles X ruled France and Navarre until the French Revolution in 1792. The Pillars of Hercules are on either side of the coat of arms and the phrase “plus ultra,” meaning “further beyond,” appears on a banner wrapping around the pillars. “Further beyond” refers to exploring the Americas and former Spanish territories. The coat of arms also includes the Imperial Crown, used by King Charles I of Spain, and the Royal Crown on the right. The first Icelandic flag has its roots in the mid-14th century when Iceland’s coat of arms included a silver stockfish with a gold crown. Iceland had no real need for a flag until 1809, when a British sea captain from Denmark, Jörgen Jörgensen usurped Iceland and declared himself king. In doing this, he announced Iceland’s first flag, a blue banner with three stockfish in the upper left corner. Jörgensen was arrested shortly after doing this, but it wasn’t until 1870 that an Icelandic artist, Sigurdur Gudmundsson, created a new flag with still the same blue background, but this time with a silver falcon in the center. The earliest version of the Icelandic flag as we know it today was created by Icelandic poet Einar Benediktsson in 1897. In a newspaper article, he claimed that the falcon flag needed to be replaced because it didn’t follow international traditions. His version of the flag featured a darker blue background with a large white cross. The King of Iceland at the time didn’t approve of this flag, however, claiming it was too similar to the Greek flag. The blue and white flag continued to be used unofficially until June 12, 1913, when Einar Petursson was arrested after rowing a boat and flying a small blue and white Icelandic flag around the Reykjavik harbor. Icelanders were outraged by the incident and began flying the blue and white flags everwhere. This incident prompted a meeting to create an Icelandic flag that would be officially adopted. Although the parliament wanted the blue flag with the white cross, Danish authorities that were ruling Iceland at the time, would not allow this due to its similarities to the Green flag. The committee decided on an official flag containing a blue background with a red cross bordered in white on June 19, 1915. The King of Iceland officially accepted the flag on November 30, 1918, just one day before Iceland became a separate kingdom from Denmark. The flag of Iceland as we know it today was adopted on June 17, 1944 when Iceland became a republic. It is the same as the early 20th-century flag, only the shade of blue is slightly darker. Iceland has strict rules about when and how its flag can be flown, including that the flag is not to be flown before 7:00AM and should be flown until after sunset but not beyond midnight. The flag is always fully drawn on the President of Iceland’s birthday, New Year’s Day, Easter, the first day of Summer, May 1, Pentecost, Sailor’s Day, June 17, December 1, and Christmas. Unlike many other flags around the world, Mexico’s national flag is one that has not changed significantly since its first version in 1821. The design of the first Mexican flag was greatly influenced by the flags Mexicans were using during the War of Independence from Spain. Many of these rebel flags included the eagle on a cactus and the official flag colors: green, white, and red. Agustín de Iturbide officially decreed Mexico’s first national flag in November 1821, following Mexico’s independence from Spain, although the the flag was not officially used until July 1822. The flag included the vertical tricolor of green, white, and red, and the national coat of arms, the crowned eagle, in the center. When Mexico became a federal republic in 1823, the government altered the flag slightly. Instead of a crowned eagle, the eagle was depicted with a serpent in its right talon. The flag also included the oak and laurel branches that are still included in the Mexican flag today. The Federal Republic of Mexico gave way in 1865 to the Second Mexican Empire, and once again, the flag changed. Still keeping the vertical green, white, and red tricolor pattern, the Emperor Maximilian ordered the ratio of the flag to be changed and for the flag to include four crowned eagles, one in each corner of the flag. Each eagle stands on a cactus, which is on a rock in a lake, holding a snake in its mouth. Mexico’s current national flag was approved by President Venustiano Carranza’s decree in 1916, officially adopted on September 16, 1968, and confirmed by law on February 24, 1984. The current flag still includes the tricolor green, white, and red, but the eagle is no facing to the side instead of to the front. The Mexican flag is rich in symbolism and history. The green strip symbolizes the Independnce Movement of the early 19th century. The white symbolizes the purity of the Catholic religion. The red symbolizes both the blood of Mexico’s national heroes and recognizes the Spaniards that joined the Mexicans in the fight for independence. The shield in the center of the white stripe includes an eagle eating a snake, standing on a prickly pear cactus that is on a rock in the middle of a lake. This coat of arms has its roots in an Aztec legend: the Aztec gods told them to build their city where they found this exact scene. The Aztecs followed this command and built their first city where Mexico City is today. The Arizona State Flag has its roots in the 1910 National Rifle Matches at Camp Perry, Ohio, even before Arizona was officially a state in the Union. Camp Perry’s shooting matches began in 1907, quickly became popular, and still continue today. Ideas for the Arizona flag first developed when Arizona rifle team members noticed that many of the states competing in the matches displayed flags or emblems representing their state. The team captain, Arizona National Guard Colonel Charles Wilred Harris, suggested the idea of a flag for use at the National Rifle Matches. Harris, along with Carl Hayden, Arizona’s first Congressional Representative, set out to designing a flag. In patriotic spirit, it was of great importance to Harris and Hayden that the Arizona flag design display historical values in both its design and colors. Nan Hayden, Carl Hayden’s wife, sewed the first flag, and it was used in the National Rifle Match in 1911. In 1912, Harris, now Adjunct General of Arizona, designed a similar flag for use as a state flag. The Arizona State Legislature officially adopted Harris’s flag on February 17, 1917, despite Governor Thomas Campbell’s refusal to sign the bill into law. The Arizona State Flag consists red and yellow rays on the top half, a blue bottom half, and a copper star in the middle. There are 13 red and yellow rays, symbolizing the 13 original colonies of the United States and Arizona’s 13 original counties. The red and yellow symbolize both the colors of Arizona’s beautiful sunsets. Red and yellow are also the colors on the Spanish flag flown by Francisco Vasquez de Coronado and his conquistadors during their search for the Seven Cities of Cibola in 1540. The blue bottom half of the flag represents the Liberty Blue found on the U.S. flag. The copper star in the middle of the flag represents Arizona’s copper-mining industry, which produces the largest amount of copper in the nation. Arizona indeed has a beautiful flag, and reasons for Thomas Campbell’s refusal to accept the flag are unknown. As if to spite him, however, a 2001 poll by the North American Vexillological Association voted Arizaon’s state flag as the sixth best flag on the continent.